Non-greasy body lotions are a must, not only during summers but also during monsoons.. ❤ They quench the skin’s thirst for hydration while not making it uncomfortable and hard for the skin to breathe.. DESCRIPTION: Do you want a caring, extra whitening body lotion that also has sun protection factor? Nivea extra whitening cell repair lotion with spf 15 has been specifically designed for the needs of asian skin. Formulated with super fruit extracts of camu camu and acerola cherry ,this lotion offers 50 times higher vitamin C*( in comparison to lemon extract), and helps to repair the years of dullness and damage on skin. The formula with spf 15 is free of paraben, mineral oil, colourants and bleaching, proven to protect the skin from sun effectively without leaving harmful residues. 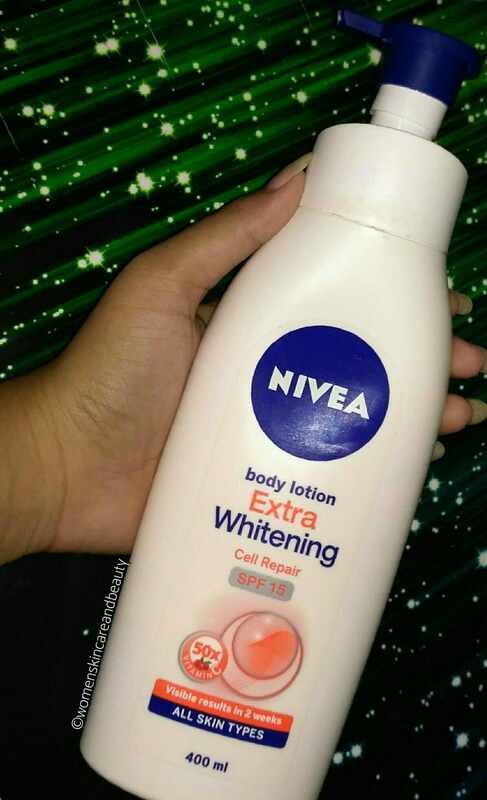 Nivea extra whitening cell repair lotion with spf 15 helps repair: Accumulated dull damaged skin, dark spots, uneven skin tone, rough skin, flaky skin, cracked skin, itchy skin. RESULTS: Your body skin is noticeably whiter and smoother with radiance within 14 days of regular use. INGREDIENTS: Aqua, c12-15 alkyl benzoate, glycerin, methylpropanediol, butyl methoxydibenzoylmethane, octocrylene, phenylbenzimidazole sulphonic acid, cetyl alcohol, dimethicone, glyceryl glucoside, glycyrrhiza glabra root extract, vutis vinifera seed oil, Malpighia glabra fruit juice, myrciaria dubia fruit juice, bisabolol, palmitic acid, stearic acid, myristic acid, arachidic acid, oleic acid, cetyl palmitate, glyceryl stearate, tapioca starch, sodium carbomer, trisodium EDTA, Sodium ascorbic phosphate, propylene glycol, citric acid, benzoic acid, trideceth-9, phenoxyethanol, parfum. COST: 75ml for INR 95; 120ml for INR 150; 200ml for INR 259; 400ml for INR 375. 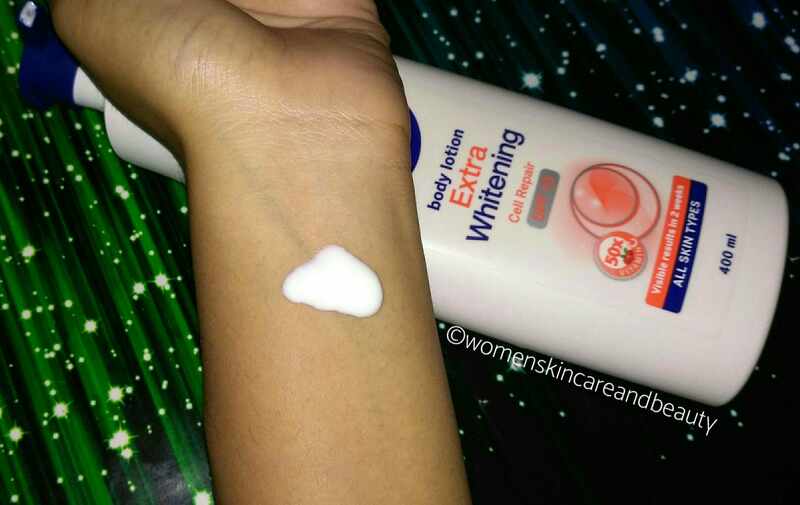 Now, as far as the “Whitening and Smoothening” claims are concerned, I haven’t noticed any Whitening or Brightening of my tanned arms or legs even after months of use.. 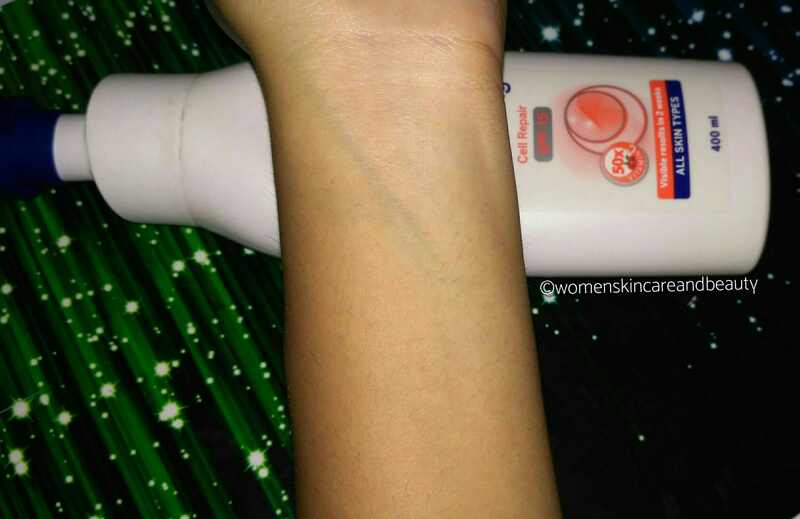 It does smoothen the texture of the skin a little bit on prolonged use but apart from that, it hardly does anything noticeable..
Also, the SPF present in it is quite less to provide a decent sun protection and I have tanned quite a bit, even after wearing the lotion liberally on exposed parts of my body..
1. Affordable and easily available. Buy it from here! 2. Travel friendly sizes available. 3. Non-greasy and easily absorbed. 4. SPF 15 is Present. 5. Smoothens skin a bit with regular use. 6. Sans Paraben and SLS. 1. Won’t suit normal to dry skin during Winters. 2. SPF present is too less to prevent skin from tanning. 3. Doesn’t live upto its “Whitening” claims. Yes.. doesn’t provide much hydration during winters! Nivea is a well known brand and has irresistible fragrance in their each products. Actually their is not product that can help in whitening. If we regularly use any product then it will benefit us for sure. But I have faith in Nivea brand as I am using their cream since childhood and it is one of my favourites. The nivea cream is really good.. i too like it and also their lip balms.. but honestly this one doesn’t even reduce tan noticeably neither has a good spf.. had they just launched it as a body lotion, it would have been nice but when it claims to Brighten skin and fails miserably it is definitely a con na! Nice and honest review , what I didn’t liked is presence of so many chemicals in it . The ingredient list is too long & scary . True that.. it is definitely a con! Yes dear.. i also didn’t find it to be very good! This is just what I wanted as of now for my tanned skin. Will go and buy it for regular use. You can try it.. but for tanning it works quite average.. 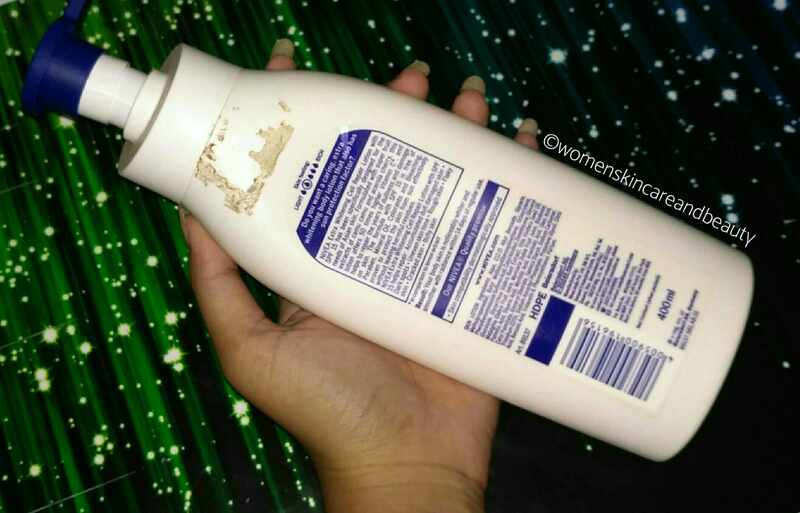 I too have used this lotion. It gives nice hydration during summer. Lovely review. I really like NIvea brand, however haven’t tried this product yet. Would love to try it soon. Nivea is one of my favourite brand thanks for honest review. Nivea has my vote of confidence and brand loyalty. Great coverage in your review mentioning all aspects of the product. Wow even I have this now with your review I will start again Nivea regime. Nivea is a reliable brand! Will try this product once! Nivea is one of my favourite brands when it comes to skin care, keep spreading love! Thank you for an honest and informative review. I do feel that SPF mentioned is not enough for sun protection. Thats true.. the spf is really less! Really this is a great product from the house of nivea. I love it for its moisturising effect. This is really good for summer and monsoon. Now a days very few people are attracted by the products whitening claims. So, it is not a matter. The product is really great for hydration of our skin. Yes that’s absolutely true.. the Moisturisation is great for oily combination skin! I like Nivea products ,they have amazing products. Nice review.. The nivea body lotion is really great. I use the one comes in Blue bottle. will try this one as well now. I like Nivea body lotions but I don’t think SPF 15 can do anything. Great review. Nivea is a great brand and they have some amazing products in few categories. Nivea is one of my favourite brand. I used it from many years. It’s one of the old and reputed brand . This lotion looks very nice and promising one. I would love to try this one product from Nivea also. Thanks for sharing your review.